As if you haven't noticed, the media has been ripe with stories of "unintended acceleration" lately. That said, we thought a story of intended acceleration may be appropriate. We found this report from French newspaper, Le Parisien, of an Audi R8 blazing through a French speed trap at an estimated 300 km/h (186 mph). Here's the kicker - The driver tested positive for marijuana after being apprehended by police. 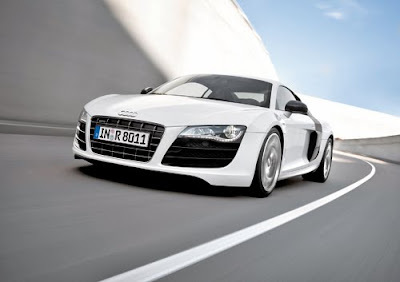 As previously mentioned, the R8 was clocked at an estimated speed of 300 km/h. In fact, the bloodshot-eyed Frenchman sped through the trap so fast, that radar guns were unable to accurately clock the R8's speed. Once through the speed trap, the driver led police on a high speed chase reportedly "performing zigzags in the flow of traffic," before ultimately being stopped by a road block. Apparently, the R8 was registered in Germany and was rented for €1,500 a day. After renting the car, the driver and passenger (both French) made a detour through Belgium before being stopped by French police. And, as if that doesn't sound suspicious enough, the car was found to carry traces of drugs and was equipped with removable license plates. All of this leads police to suspect the car may have been used as a high-speed drug transport. After the smoke cleared, both men were charged with endangering the lives of others, excessive speeding and driving under the influence of drugs.